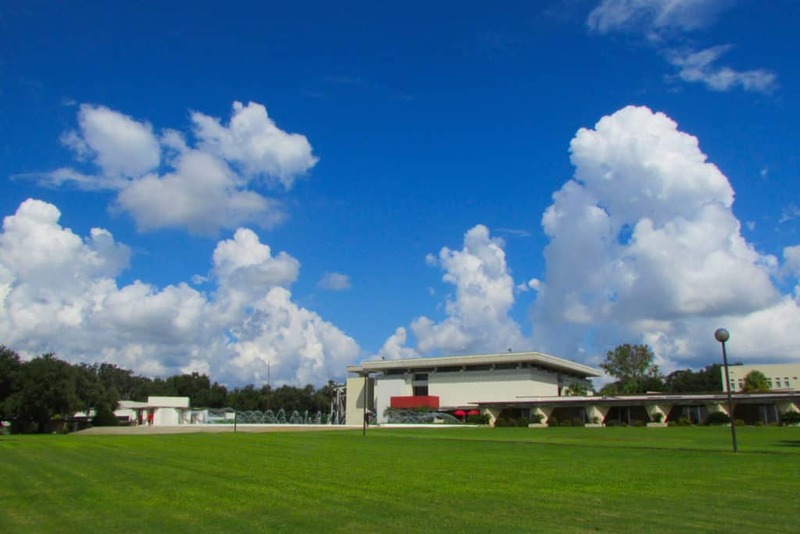 On land that was once an orange grove in Central Florida, sits the world’s largest single-site collection of structures designed by famed modernist architect Frank Lloyd Wright. 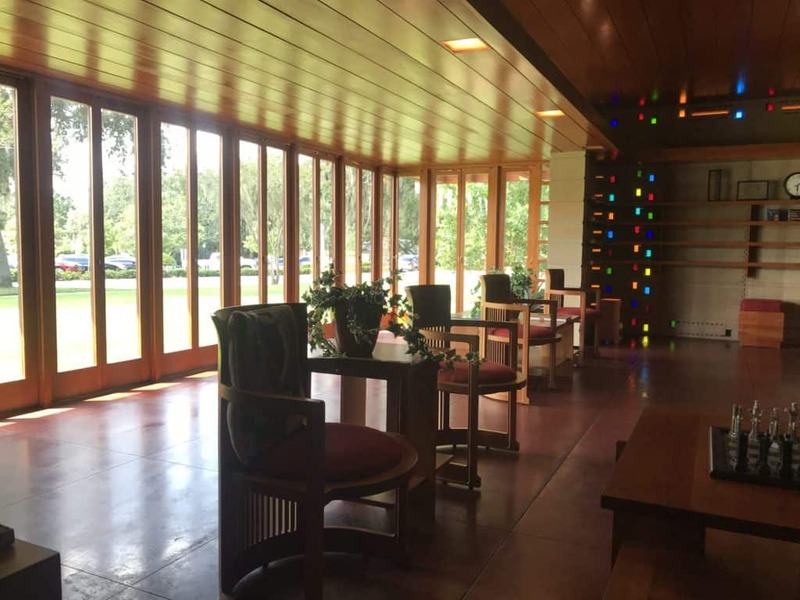 I recently toured Florida Southern College, a steward of Wright’s architectural legacy, where 13 buildings he designed comprise the majority of campus. 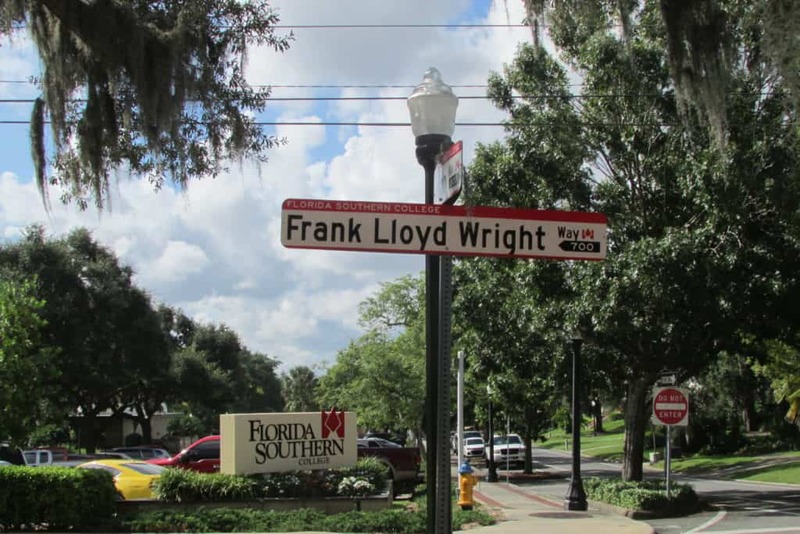 80 years later, Wright’s presence is omnipresent: The street aptly named Frank Lloyd Wright Way leads to the visitor’s center where organized tours depart and gift and books are available for sale. 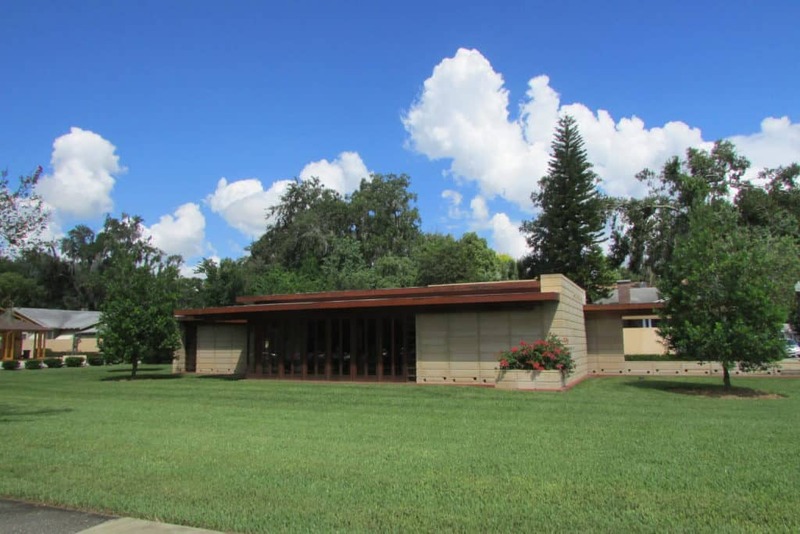 The story of how this small private Methodist liberal arts college became an internationally famous destination for architecture tourism begins with an unlikely alliance between Wright and Florida Southern College’s President, Dr. Ludd Spivey. 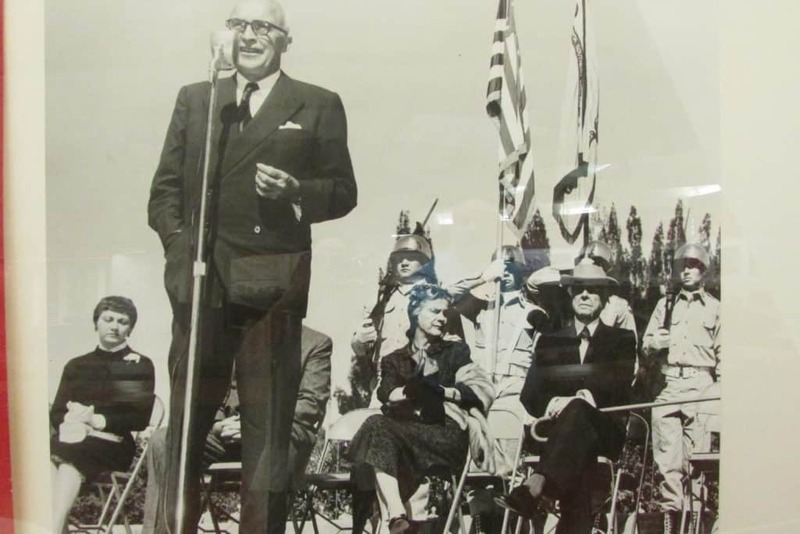 During the Great Depression, Dr. Spivey was looking to make a name for the college, attracting new students and establishing a reputation as a forward-thinking institution. In 1938, with no money to build but a grand vision, Dr. Spivey traveled to Wright’s architectural school at Taliesin in rural Wisconsin to convince the famous architect, now squarely in the second act of his career at 70 years old, that Wright should design the campus. Wright accepted the commission in spite of his dislike for higher education. 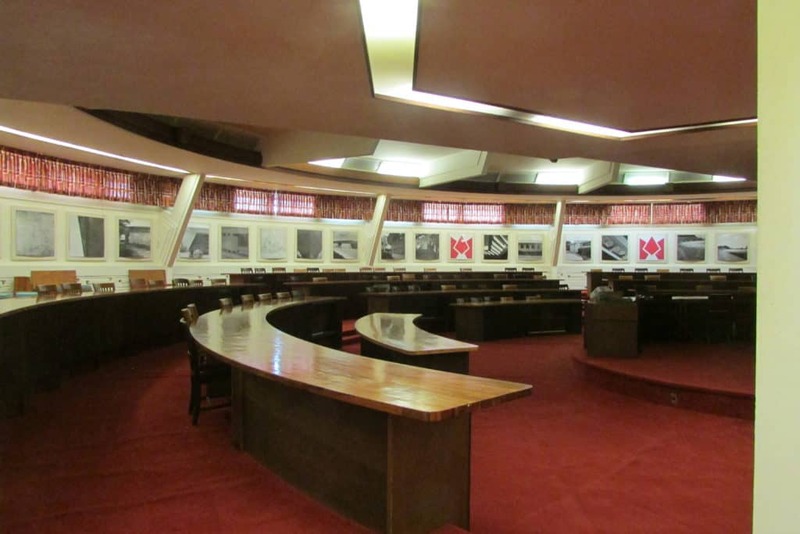 Florida Southern College is a National Historic Landmark and listed on the World Monument Fund’s 2008 World Watch List. “This is the only college campus Wright designed. He wasn’t in favor of higher education and thought it took away from the free thought process. 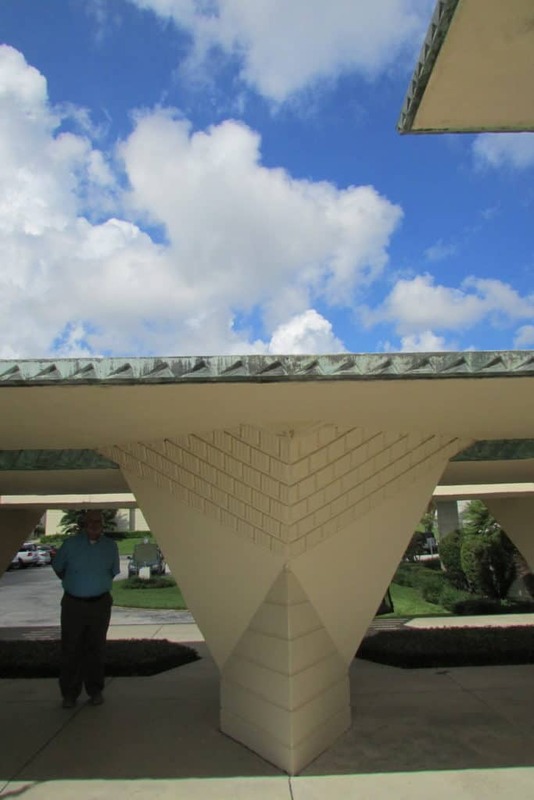 He felt one of the best ways of a student to learn was by doing,” says Mark Tlachac, retired Director of the Frank Lloyd Wright Visitor Program at Florida Southern College. Mark is my tour guide and together we walked the campus for three hours, stopping to take in every architectural detail. The north end of the administration buildings designed by Frank Lloyd Wright. Side view of the William H. Danforth Chapel designed by Frank Lloyd Wright showing the triangular leaded glass clerestory windows. “This is a perfect Frank Lloyd Wright setting with its gently sloping hillside that was a citrus grove. Wright wanted the buildings to blend with the landscape they were on. He wanted to build out of materials native to the site. The land was very sandy so Wright built the buildings out of concrete blocks mixing sand and pulverized seashells in the concrete,” says Mark. 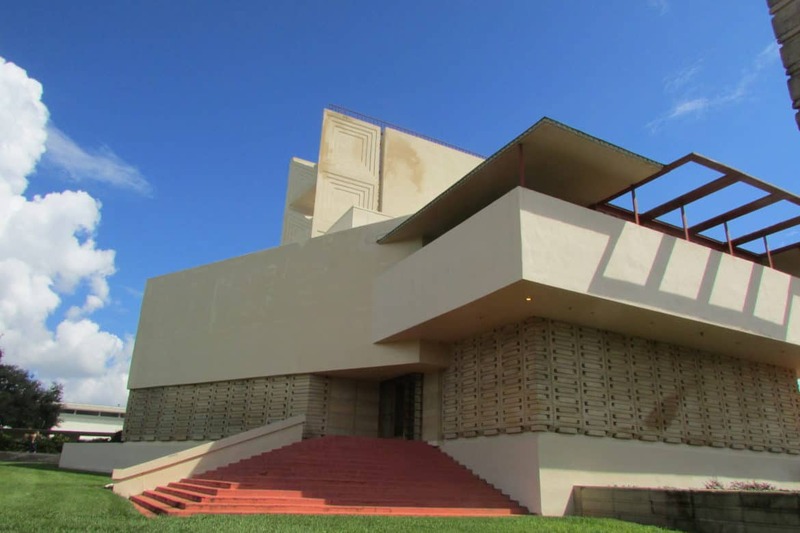 Tapestry blocks Wright designed that form the structural basis of all 13 of his buildings on the campus of Florida Southern College. The block had large matching notches for stacking instead of staggering. 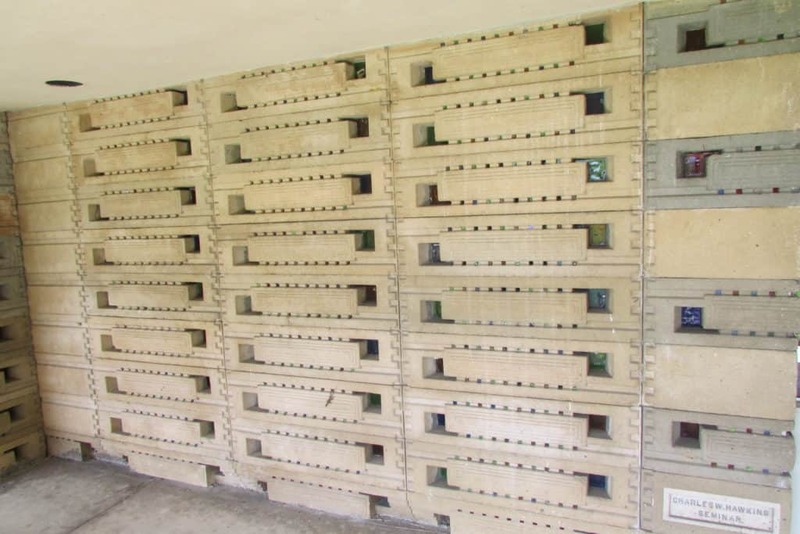 The blocks were together with small steel bars and mortar. Wright designed a building system using tapestry blocks made of concrete mixing in native sands and crushed shells. The concrete blocks had colored pieces of glass embedded that sparkled like jewels in the sunlight. Florida’s harsh climate would later necessitate the restoration of the blocks because of cracking and expansion. After WWII the blocks became more simple construction without the glass inserts. 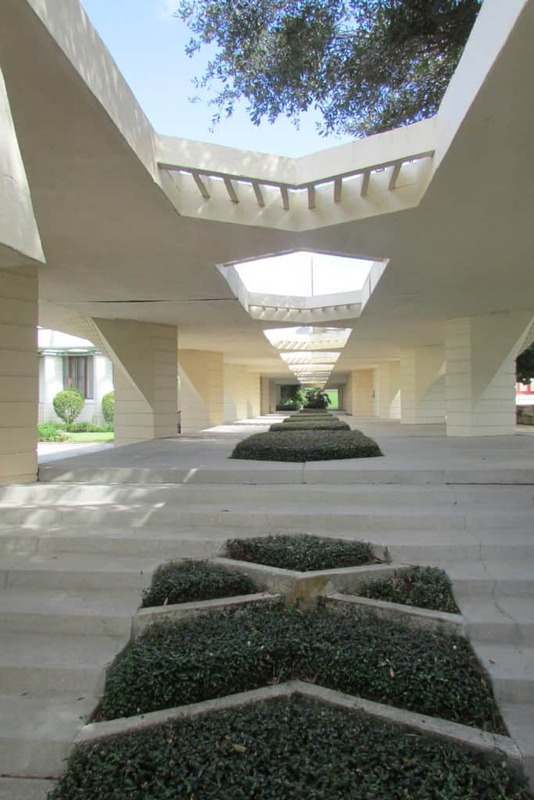 “Wright used geometry to design the campus. We have squares, triangles, rectangles. He laid out all the land in six-foot squares with grid lines that run north and south and east and west. He did the same thing vertically so he built six-foot cubes of space throughout the entire campus. Every building lines up perfectly with one of his gridlines geometrically to perfection,” Mark says. At the heart of campus is the iconic Water Dome, the largest water feature Wright ever designed. 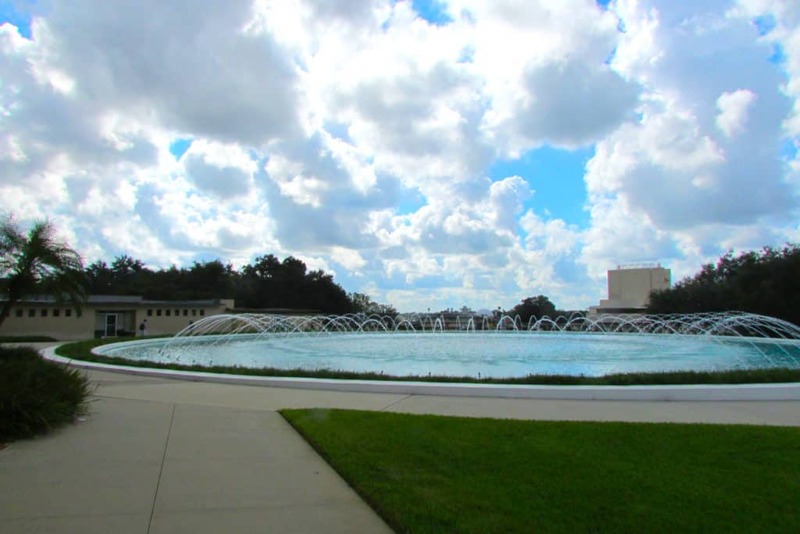 Symbolizing the fountain of knowledge, the Water Dome shoots arched water 60 feet high and spans 160 feet in diameter. 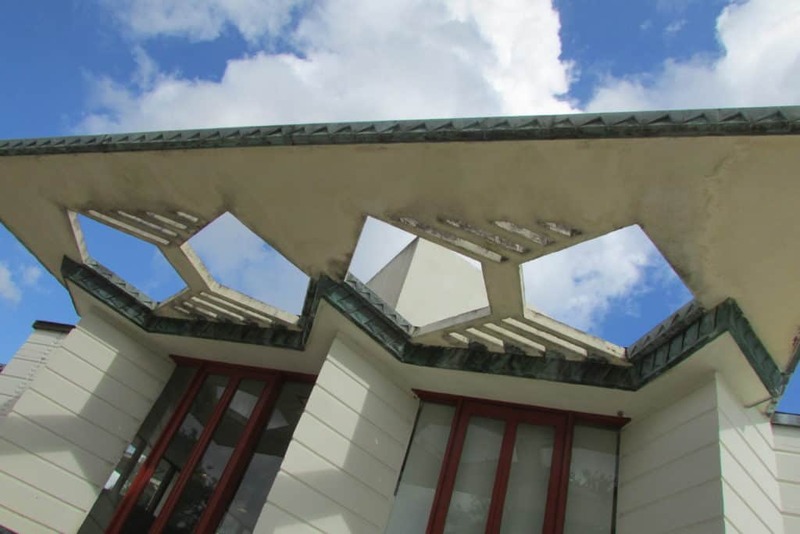 Geometric cutouts resembling butterfly wings on the Emile E. Watson Administration Building designed by Frank Lloyd Wright. 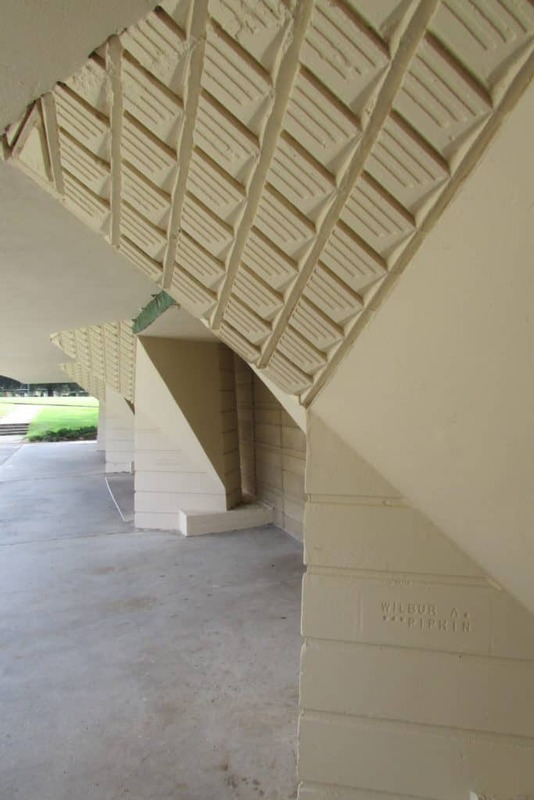 Wright used geometric thematic elements that echo throughout the campus such as these cutouts in the roof of the esplanades that resemble butterfly wings. The Esplanade, a system of covered walkways designed by Frank Lloyd Wright to connect campus buildings. Wright designed a system of covered walkways connecting his buildings known as The Esplanade that winds one and a half miles through campus. 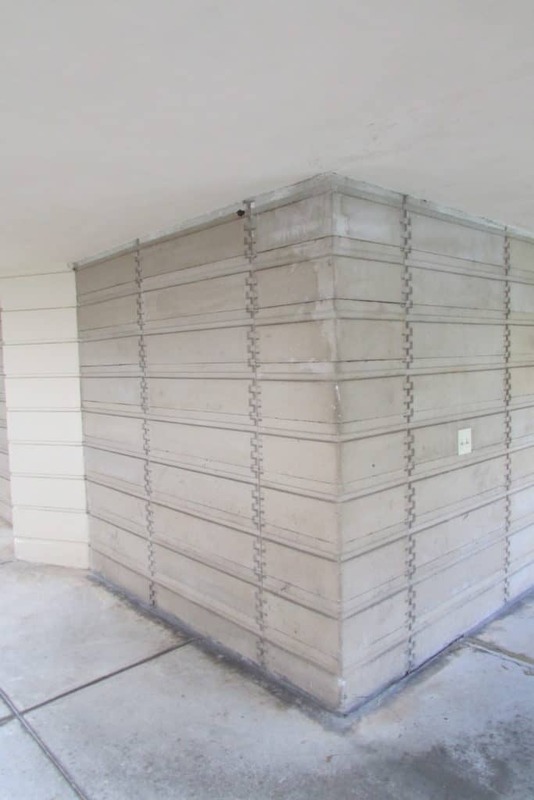 Design details in The Esplanade designed by Frank Lloyd Wright include stamped copper detailing and poured concrete columns in an abstract citrus tree design . The Esplanade is decorated with copper trim in stamped sheets along the edges. The columns resemble abstract citrus trees stamped in poured concrete. The Esplanade columns resemble abstract citrus trees. Also at the center of campus is the Annie Pfeiffer Chapel, the first Wright-designed structure built and the tallest on campus. 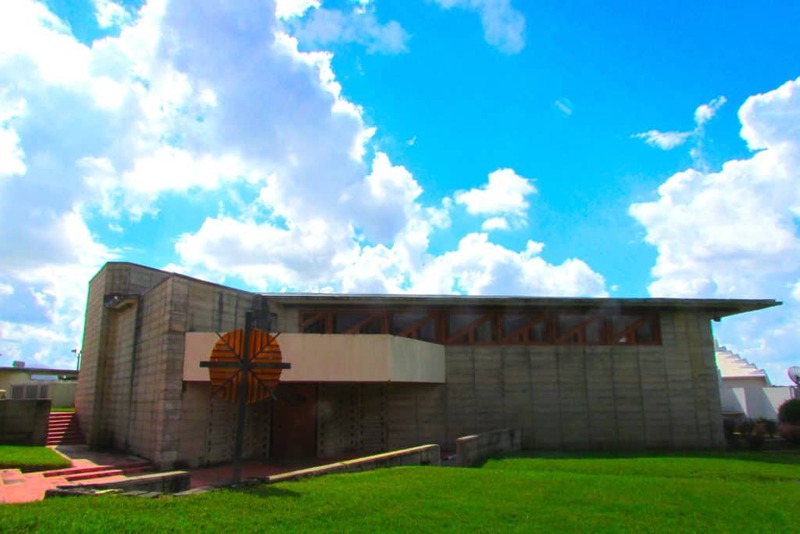 The Annie Pfeiffer Chapel is Wright’s signature building at Florida Southern College. The cantilevered wings form interior balconies. The main level has no side windows with rays of colored light piercing the concrete walls through sparkling cut glass inserts. The chapel’s tower has cutouts in the figurative shape of a bowtie echoed in the college logo. 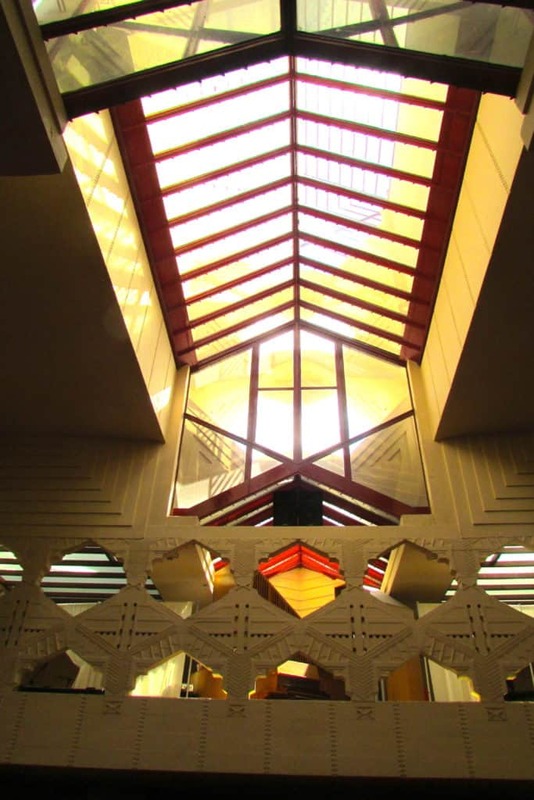 The skylight in the Annie Pfeiffer Chapel provides a view of the tower superstructure. 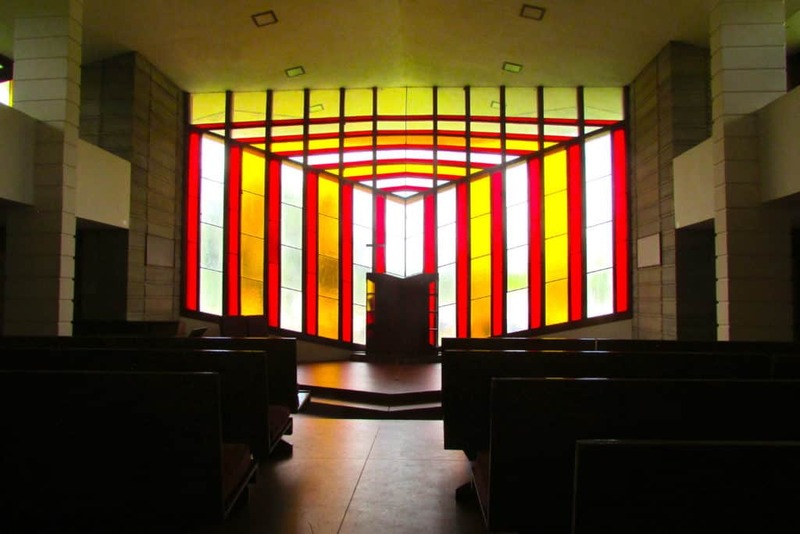 Wright did not design windows on the lower level of his chapels because he didn’t want them to distract. 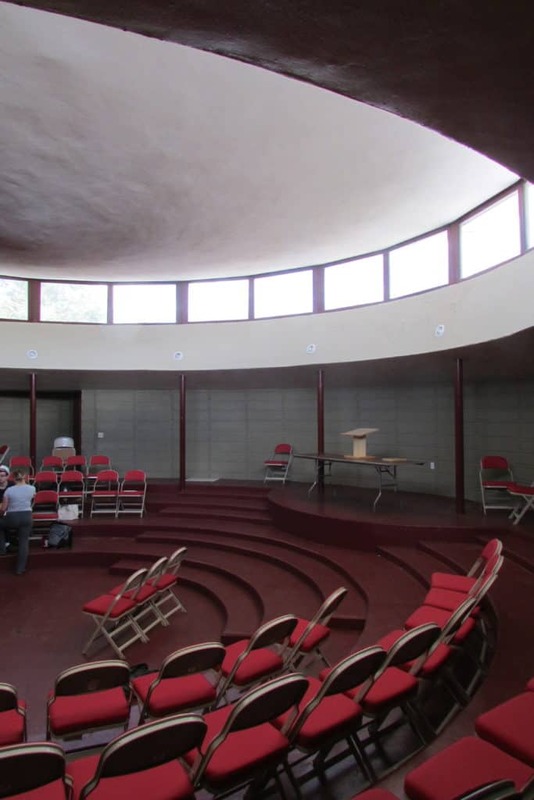 Instead, he designed skylights to fill with the chapel with light from above, like God shining down on his people. 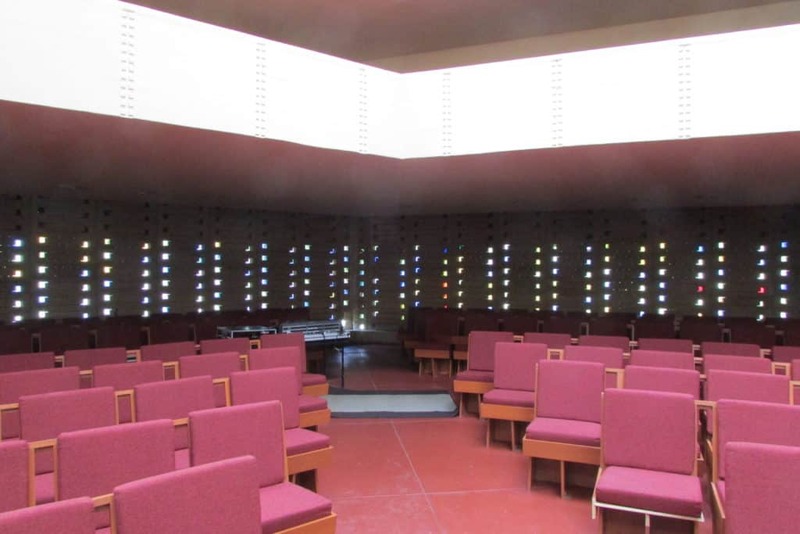 In the Annie Pfeiffer Chapel, all of the seats face towards each other to foster togetherness. The Annie Pfeiffer Chapel consists of the main level and cantilevered balconies. 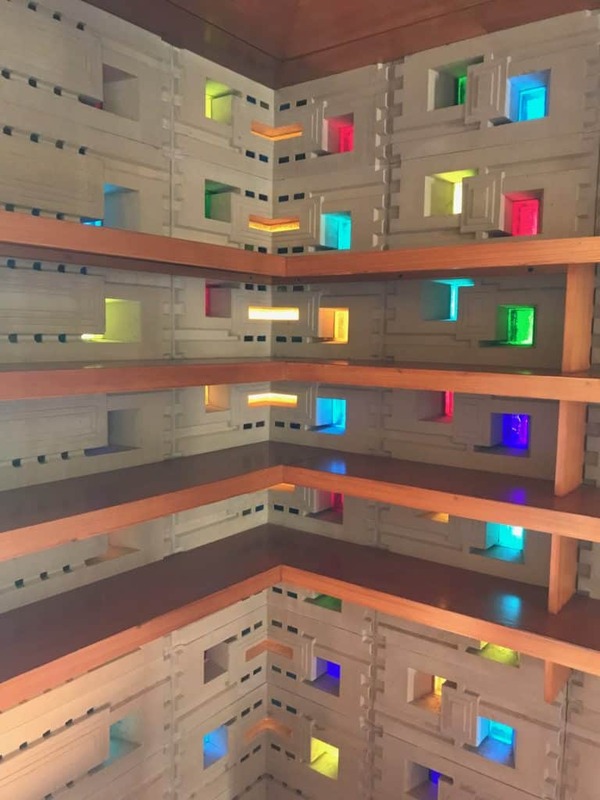 Notice the rays of colored light that pierce through the concrete blocks, a signature design element of the campus. 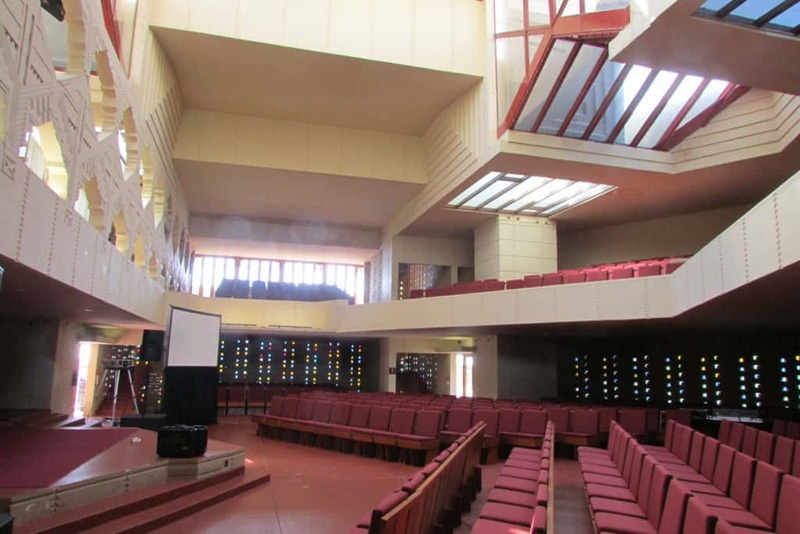 Wright designed a second campus chapel, the William H. Danforth Chapel as a place of meditation with a large leaded stained glass window in a slanted parallelogram design at the pulpit. The floor-to-ceiling stained glass juts out at an angle visible from the southwest facade. Framed in native Florida tidewater red-cypress, the chapel still contains the original pews and cushions Wright designed and students built. The round reading room in The E.T. Roux Library. The E.T. 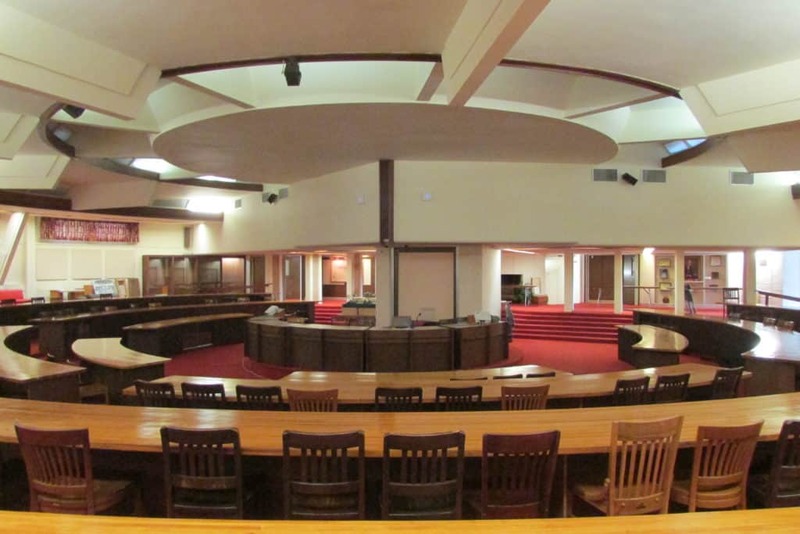 Roux Library was the fifth Wright-designed structure constructed on campus distinguished for its round reading room interrupted by an irregular oblong section. Clerestory windows encircle the reading room evoking a spaceship silhouette. 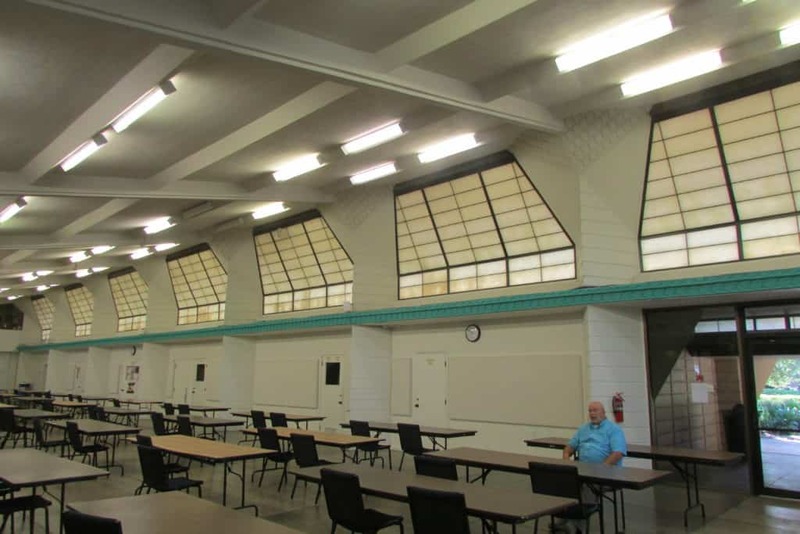 The library is now used for meetings and office space and the original clerestory windows have been glazed over to block out sunlight. 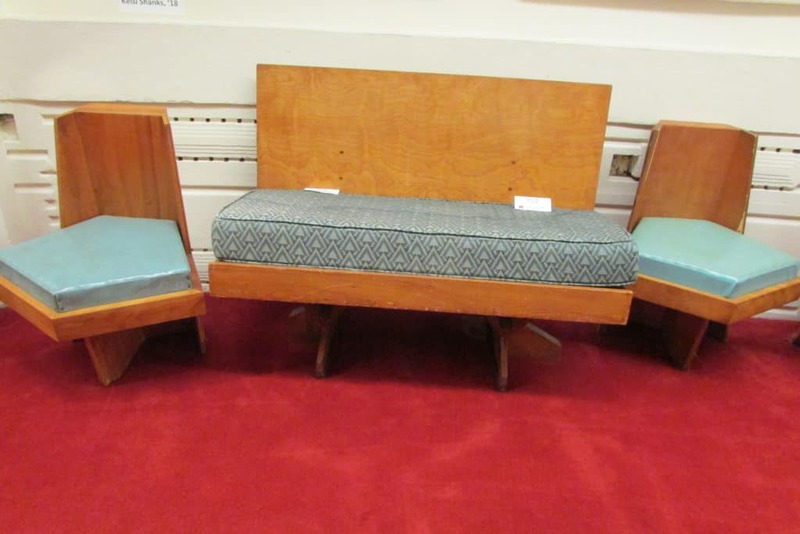 Wright designed these pieces for the library. The low chairs had three legs and purportedly, students would topple over when they sat in them but Wirhgt said all students need to learn to sit up straight with good posture. Wright developed an affinity for plywood as a material for furniture because it was inexpensive and could be cut and molded to make all sorts of shapes. 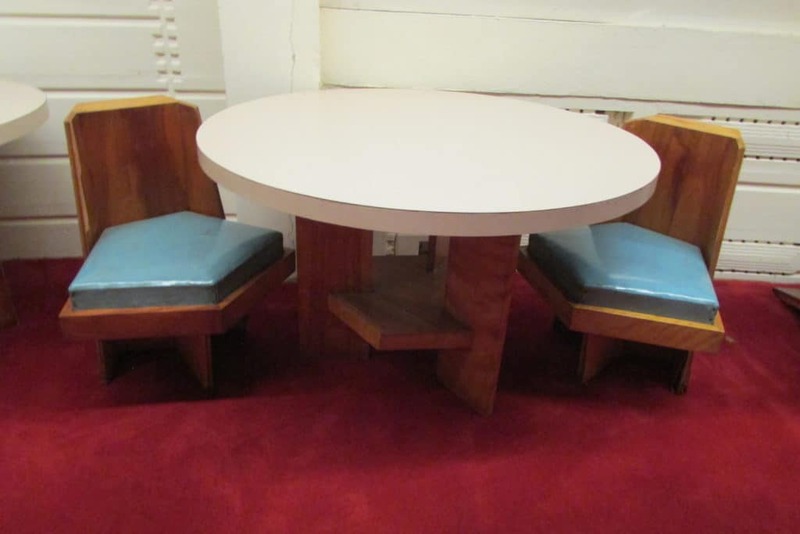 Furniture designed by Frank Lloyd Wright and built by students at Florida Southern College for the library. The original floors were Cherokee red concrete, a deep dark red that was Wright’s favorite color. Today the floors are covered in red carpet. 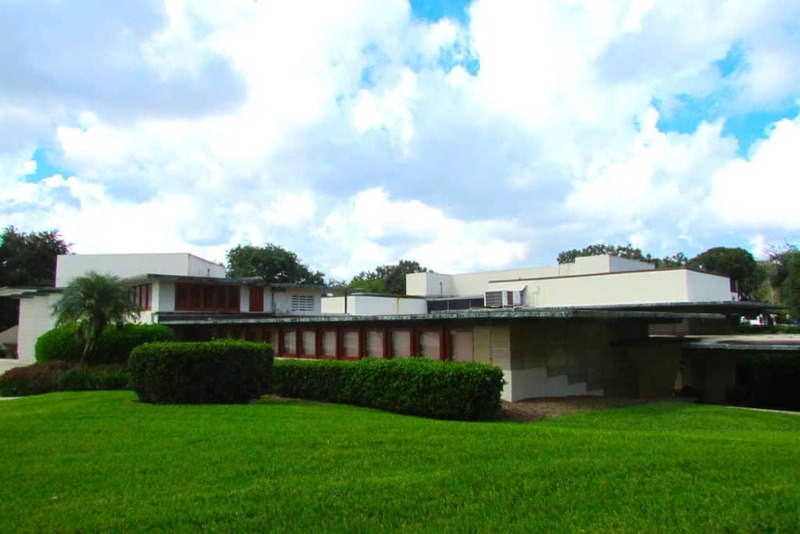 The Lucius Pond Ordway Building, designed by Frank Lloyd Wright for Florida Southern College once housed the industrial arts program. 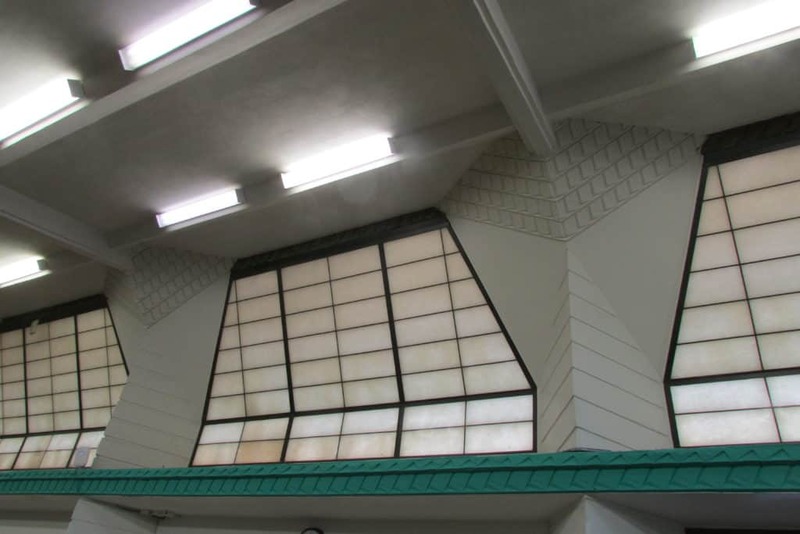 Clerestory windows in the Lucius Pond Ordway Building, designed by Frank Lloyd Wright for Florida Southern College. The Ordway Arts Building constructed in 1952 has retained its original courtyard that connects two parallel arms and a theater-in-the-round. The Fletcher Theater is located at the north end of the west section with its rounded ceiling designed for perfect acoustics and illuminated by Wright’s signature clerestory windows. We end our tour at The Usonian house designed by Wright in 1939 as faculty housing. Originally Wright designed 20 such houses for the campus that were never built. 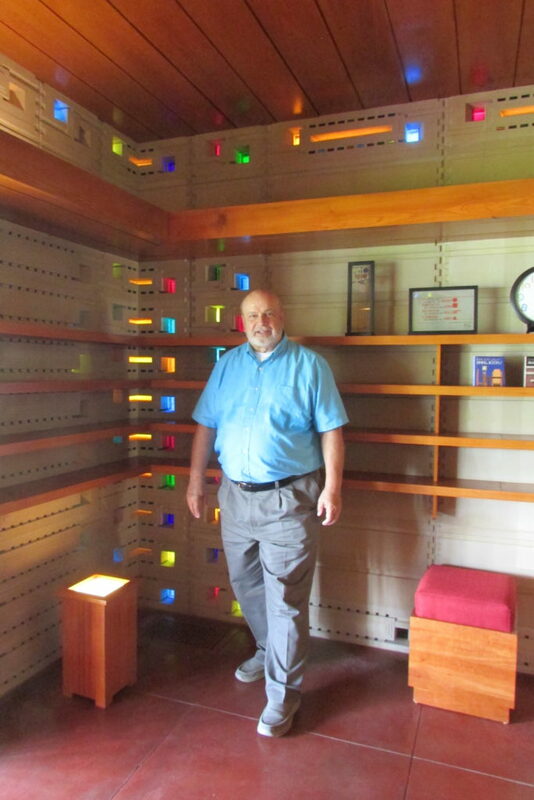 In 2013, the college built a prototype of The Usonian House open for public tours. The 1,200-square-foot home is illuminated by a flood of natural light coming through the floor to ceiling glass windows. Constructed of approximately 2000 interlocking concrete blocks, the home has two bedrooms and a single bathroom but feels and functions as a larger living space. “Some people think Mr. Wright designed giant mansions but the vast majority of his work was two bedroom houses. He wanted to be the architect for the common man,” Mark says. 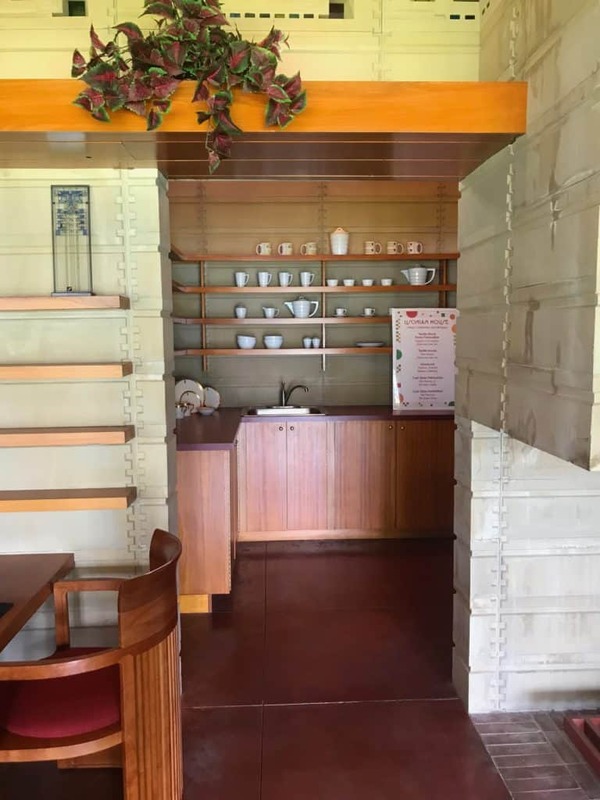 Concrete blocks with colored glass inserts and corner shelving in the Usonian House designed by Frank Lloyd Wright. 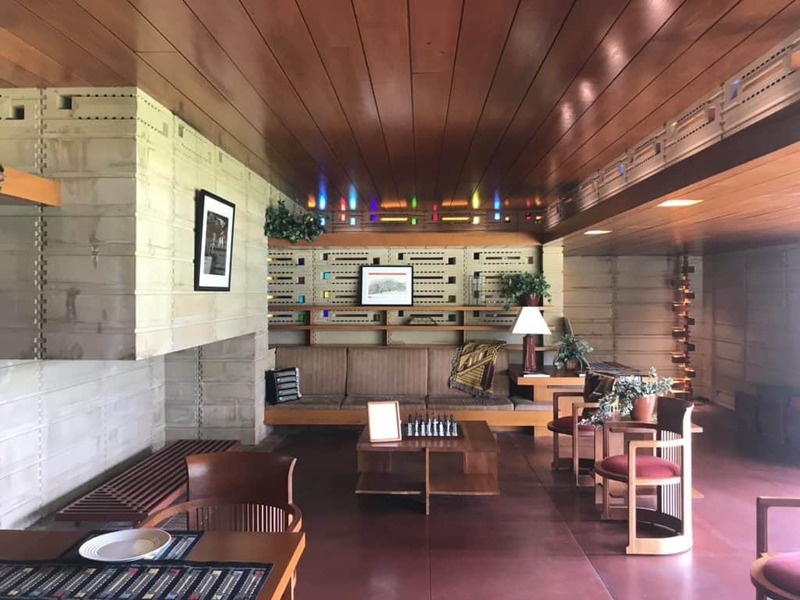 Wright developed his Usonian design style during the Great Depression as an affordable structure for the average American. The kitchen in the Usonian House opens up to the main living spaces. Frank Lloyd Wright was the first architect to open up a kitchen to the living room. The floorplan features a small kitchen with high ceilings lined with windows above that open for air circulation. 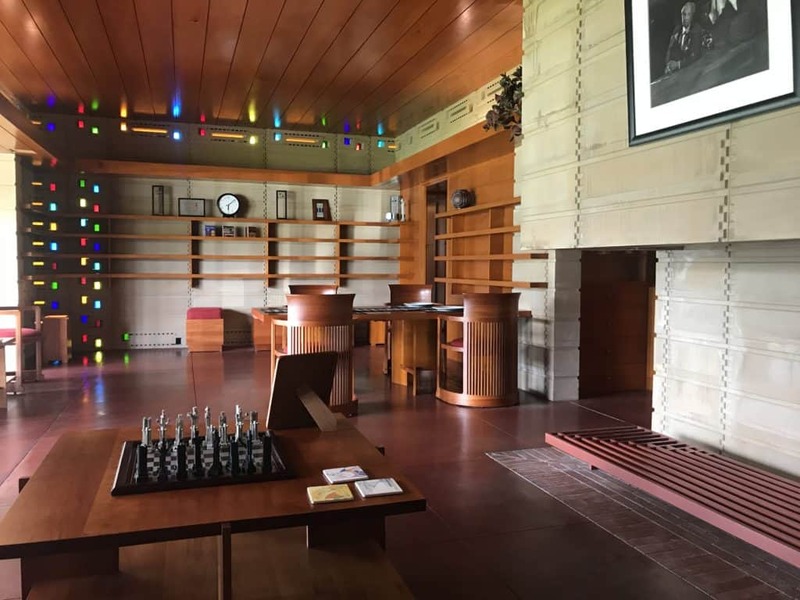 The living room of the Usonian House designed by Frank Lloyd Wright. 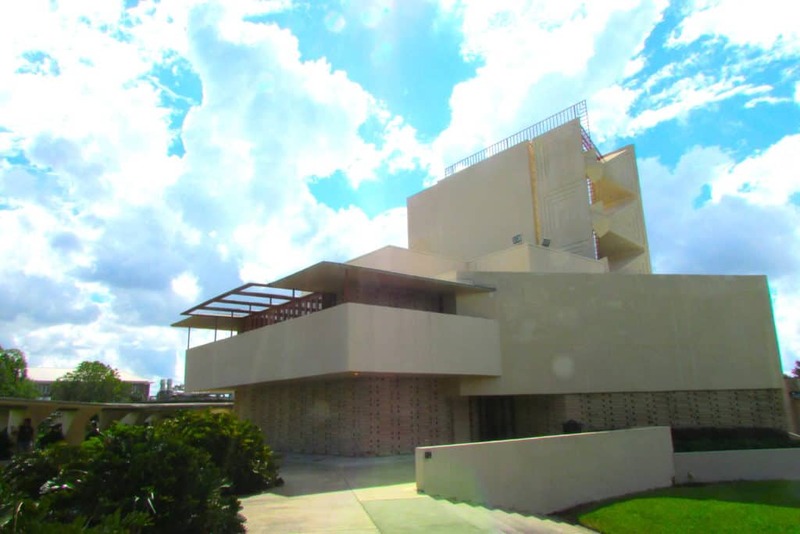 The house is open for public tours at Florida Southern College. 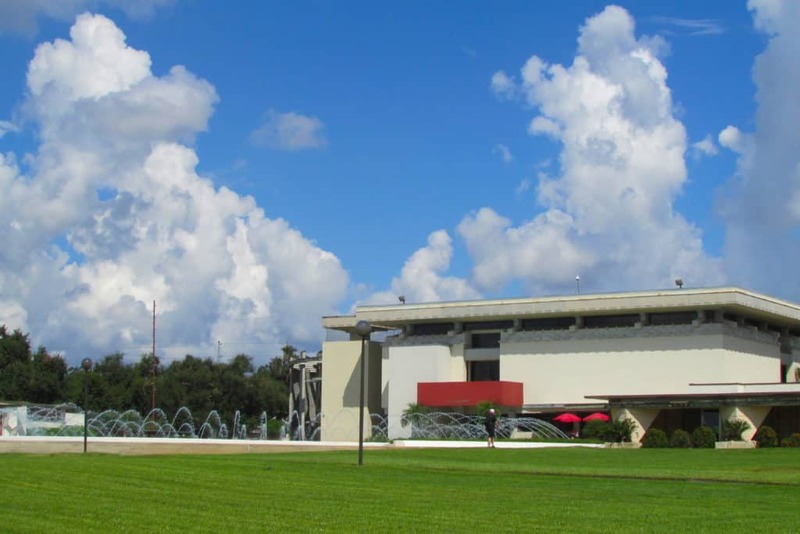 Florida Southern College campus view of the Water Dome and Esplanade designed by Frank Lloyd Wright. Today, Wright’s “Child of the Sun” has matured into an architectural legacy with lessons about our relationship to the landscape and the built environment in the halls of higher learning.